So what did Wineware get up to over the weekend? 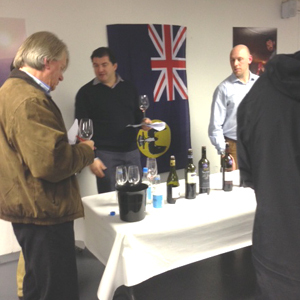 To keep up to date with the best wines of 2013 (so far) we attended Matthew Jukes’ tour of his ‘100 best’ Australian wines. 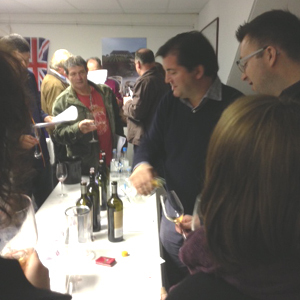 The evening was held at Hennings Wine Merchants at the Pulborough cellars and received an extremely good turnout. Wine was certainly not in short supply – with an abundance of wines on offer we had our work cut out! Hennings made excellent use of their space, as always. The cellars were set up beautifully and organised well with seven tables (labelled A-G) manned by Hennings staff (or the ‘wine squads’ as we like to call them!) Each table held about six/seven bottles and using the provided sheets we could mark our favourite wines of the evening and subsequently place our order at the end of the night. There was a great buzz in the well-lit room with plenty of wine flowing and lots of exciting chatter! From well-travelled wine tourists to wine enthusiasts, the Matthew Jukes roadshow brought wine lovers together for a fantastic wine tasting event. This is a sensational wine, the combination of mulberry and crimson cheery fruit notes is a sheer pleasure to taste, leaving you wanting more. We definitely savoured each drop of this Pinot Noir! It does need another three to five years to develop and gather complexity but give it time and you will love this wine. It was our star of the evening. A calm, composed wine with an everlasting finish, what more could you want? This wine has brilliant structure and complexity and we cannot recommend it enough! Revisiting our tasting notes is the best way to describe this fine wine. “Beautifully concentrated blackcurrant…herbs…roasted chestnut notes…deep in colour…flavoursome…firm” One to be tried this year! This rich and delicious, indulgent red wine is a sheer delight to nose let alone taste. It is the highest scoring wine on Matthew Jukes’ list and we know why! We are now singing the same tune as Mattthew, we love this wine! (*Too many exclamations? Well try the wine and you’ll know why). “Nectar! Honey in a bottle!” What more needs to be said about this intense honey flavoured wine with a mandarin palate and apricot skin-fresh finish. Simply delicious are two words that spring to mind. Plenty of Aussie wines on offer! Hennings did a superb job with their venue and created a delightful ambiance. Thank you of course to the renowned and widely loved wine journalist and critic Matthew Jukes for a thoroughly enjoyable evening. We hope to attend another event in the near future; this means very soon. To connect with Matthew Jukes you can visit his website, find him on Twitter (@MatthewSJukes) or attend his forthcoming events.